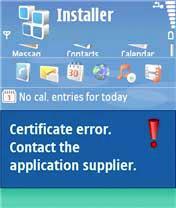 How to solve expired certificate in your Nokia 3rd & 5th version. 2. After Downloading Extract the folder and move it in a new folder. 3. 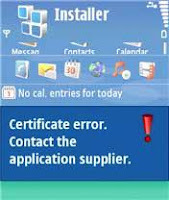 Now move that expired soft in the folder where you kept "sign4ever"
When the blue screen comes then press "any key "
5. After that you will some new file and new icon inside. 6. Now wit In a few minute you will see two file. 7. Don't think about the .bak file it is just helping file . 8. Now rename the signed.sis in your original softs name. 9. Now copy and keep in your mobile phone and install it. it will not create any problem within next 20 years. Sir the soft link(which one creates problem) I will try to solve the problem and provide you the solutions.